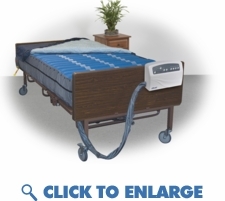 This 48" bariatric mattress system provides alternating pressure to optimize pressure redistribution for patients with up to Stage IV pressure ulcers in the home, long term care, or acute care setting.10" deep static perimeter tubing surrounds the length of the mattress preventing the patient from becoming trapped between the mattress and side rails.Cell-on-cell design of 8" deep air cells prevents "bottoming out" and also provides up to 24 hours of power outage protection. Digital pump allows for customization to individual patients' comfort and safety needs, and will auto-return to alternating pressure mode if system is left on static mode for >2 hours.4-way stretch cover is low sheer, fluid resistant, vapor permeable, quilted and zippered.Each one of the 20, 8" deep air bladders are easily removed and replaced. Pillow function maintains the 3 air cells at the head of the bed in static mode for patient comfort.3 diagnostic alarms tell you whether a problem is with the mattress or the pump for more efficient servicing.450 lb weight capacity.CPR valve allows for rapid deflation. This 48" bariatric mattress system provides alternating pressure to optimize pressure redistribution for patients with up to Stage IV pressure ulcers in the home, long term care, or acute care setting.10" deep static perimeter tubing surrounds the length of the mattress preventing the patient from becoming trapped between the mattress and side rails.Cell-on-cell design of 8" deep air cells prevents "bottoming out" and also provides up to 24 hours of power outage protection. Digital pump allows for customization to individual patients' comfort and safety needs, and will auto-return to alternating pressure mode if system is left on static mode for >2 hours.4-way stretch cover is low sheer, fluid resistant, vapor permeable, quilted and zippered.Each one of the 20, 8" deep air bladders are easily removed and replaced. Pillow function maintains the 3 air cells at the head of the bed in static mode for patient comfort.3 diagnostic alarms tell you whether a problem is with the mattress or the pump for more efficient servicing.450 lb weight capacity.CPR valve allows for rapid deflation. Maximum Support Capacity: 750 lbs.